Fresh air, sunshine, and play time are three of my favorite things. That's why I started taking my girls outside to play shortly after they were born. I wanted them to appreciate the evergreen benefits of outdoor play, benefits that kids who enjoy nature from a young age will enjoy throughout their lives. Your children can enjoy these benefits, too. Learn what they are as you encourage outdoor play! One in three American children is obese, and that's why kids need outdoor play. It boosts physical fitness. They can run, jump, swim, or hike as they get aerobic exercise, strengthen their bodies, and stay fit. Vitamin D strengthens bones, helps prevent diabetes, and fights depression and heart disease. Give your kids natural vitamin D when you take them outside to play. They'll be happier and healthier. Within minutes of going outside, stress levels fall for both kids and adults as they relax and escape from their hectic lifestyles. This is one of my favorite reasons to head outside and enjoy green space, fresh air, and play time with my kids! I can feel the stress melt away as we play outdoors. Kids who play outside have to use their imaginations and cultivate creativity as they invent playground games, make up nature rhymes, and draw chalk sketches on the sidewalk. With that creativity, kids can think outside the box, solve problems, and have fun even when they're not playing. Exposure to nature can reduce ADHD symptoms including hyperactivity, lack of focus, and difficulty concentrating. No matter how old your kids are, use play therapy as part of their ADHD treatment and watch your children thrive. Exploring nature satisfies a child's curiosity as they discover new things about the world around them and learn how things work. I know my girls can spend hours watching squirrels when we hike, and last week, they discovered what happens when they throw a disk from different angles. What will your kids discover as they play outside? When kids play, they learn to run, kick, and climb. Those physical skills help them on the sports field, if they choose to play. I also appreciate watching my girls develop gross motor skills, dexterity, and flexibility that is useful as they move, get dressed, and function in their daily lives. As kids master playground equipment, learn a new swim stroke, or discover how to jump over rocks, their self-confidence grows. They become more eager to try even more activities. Use outdoor play to help your kids be more confident in their bodies, abilities, talents, and skills. Kids learn how to interact with others and their social skills improve when they play, whether their playmates are you, siblings, or new friends. I know my girls have learned how to negotiate, resolve conflict, and share while playing, and I'm grateful that play has taught them to be nicer and more cooperative human beings. 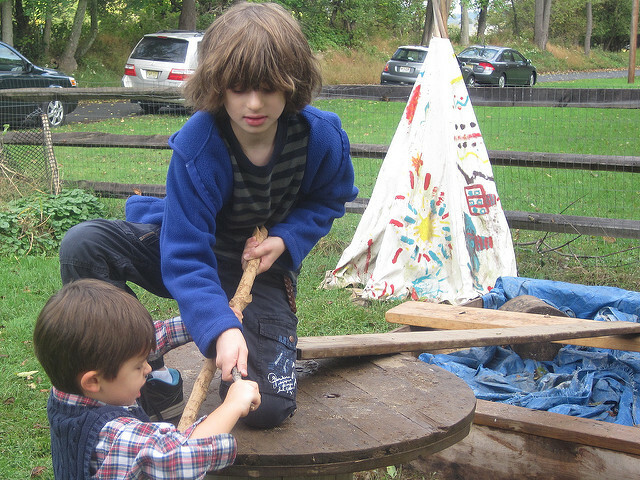 Are your kids getting the evergreen benefits of outdoor play? It's not too late. Head outside and start playing today!